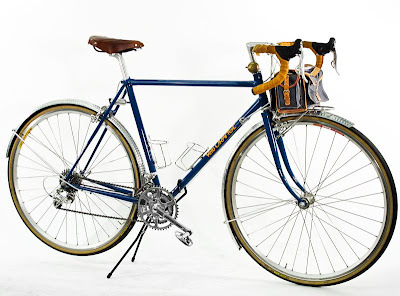 “Most cyclist don't race...” The unofficial slogan of Velo Orange, and one of our founding principles. It still holds true today that most cyclists don't race, but some of us do. 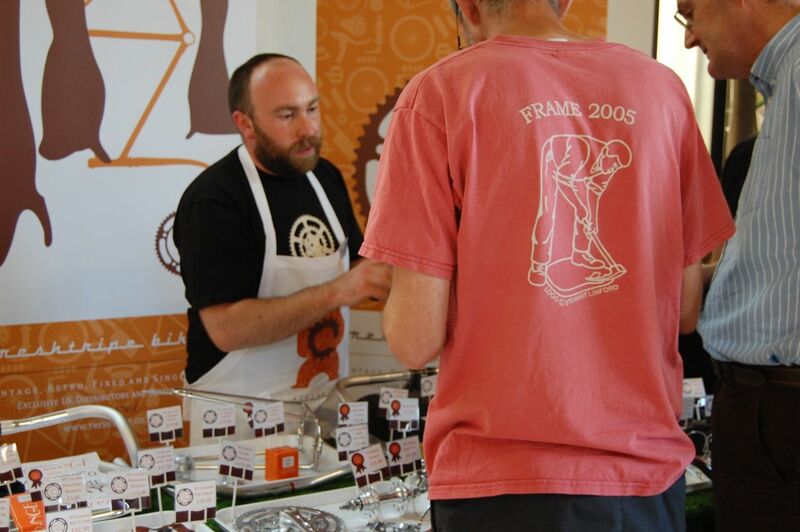 One of the great things about a company like Velo Orange is that it attracts a talented and passionate staff that all love cycling. 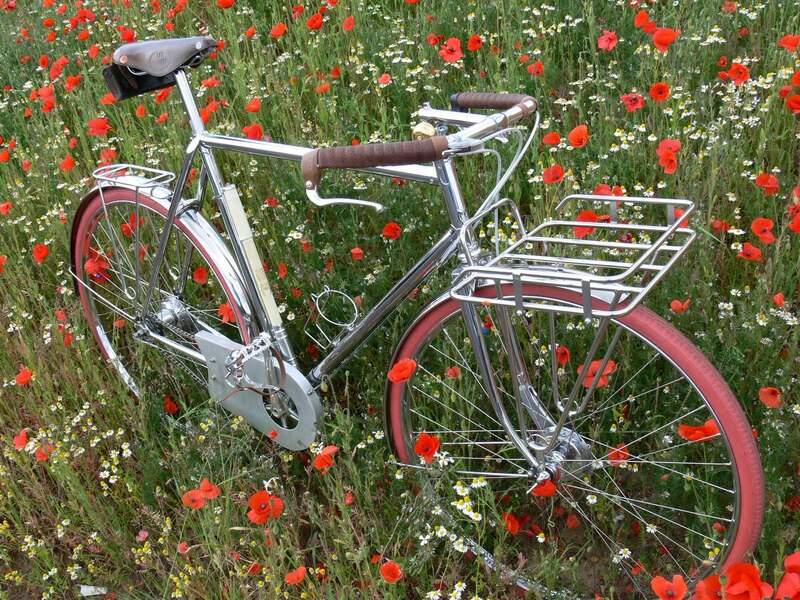 Even so, everyone is different and we all get something different from cycling. My main focus is racing and I see it both as a way to compete in the sport I love and an outlet to relieve stress and put myself to the test. 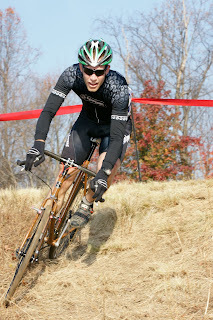 I started racing in 2003 when I learned about about local mountain bike races from a friend. I stripped the failing derailleurs off of my Schwinn mountain bike, turned it into a singlespeed and raced a local Wednesday night race. Instantly I was hooked! Racing let me push myself until I thought my heart might leap out of my chest and my legs might give out and yet still had a great time doing it. It was suffering like I had never experienced; it was fantastic. 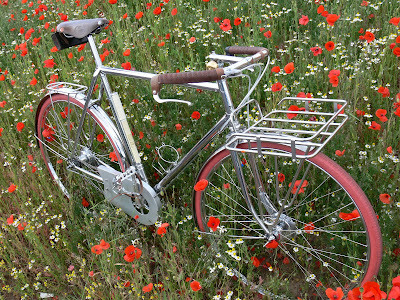 If racing is so much suffering and so at odds with the stated aim of Velo Orange, then why race? For me, it's the excitement and adrenaline of competition. Toeing the start line with butterflies in your stomach before riding all-out as hard as you can for an hour (or two, or four, or many more) is about as fun as it can get. Racing pushes me to levels I didn't know I could go; legs and lungs burning I forget all the stress in my life and think only about how this is the hardest race yet and how I can push just a little bit harder to overtake the next rider. Today I race road, mountain and cyclocross to keep the calendar full for most of the year. Of course that's my answer; when the question is “Why race?” the answer is different for everyone. As a cyclist, racing can give you a new channel to explore the sport you love. Racing is also a great way to get out and meet other cyclists and find new routes and places to ride. If you are like me, racing will also push you harder and give you more motivation to stay in shape and work on your fitness year round. Mountain biking (MTB): Popular, fun and technically challenging, MTB encompasses lots of different types of riding and racing including the cross country, various downhill disciplines and the currently popular endurance events. Road racing: If you like skinny tires and high speeds then road racing is for you. Seemingly less technical than mountain biking, it really isn't. Road racing isn't just raw speed either; strategy and tactics are the name of the game, having a great team to race with helps a lot too. 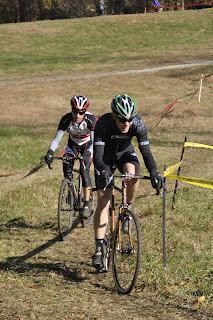 Cyclocross: My personal favorite, cyclocross combines many of the best aspects of road and mountain biking into a fun and spectator friendly sport. 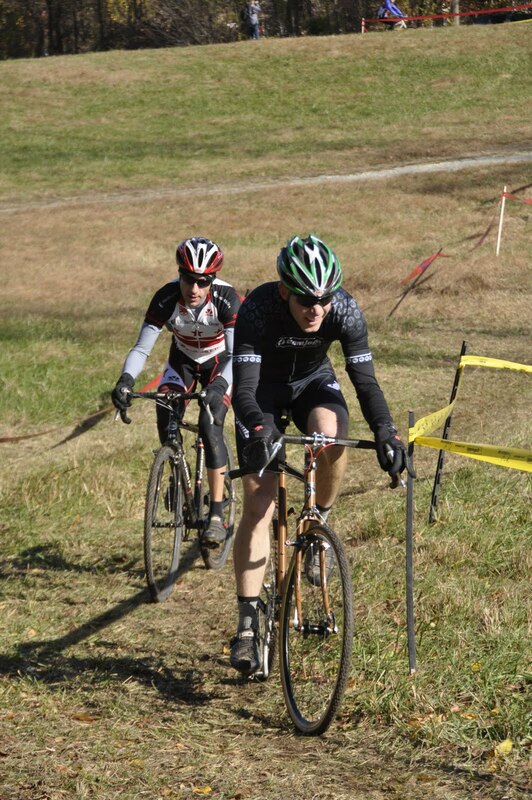 Cyclocross is characterized by mud, nasty fall weather and truly enthusiastic fans ringing cowbells. With such a welcoming crowd 'cross is a great place to start racing, not to mention that crashing in the mud doesn't hurt as much as asphalt. Track: The discipline I have the least personal experience with is track racing. This is due to sad fact that there are not many velodromes in the United States, which is a shame as track racing is fast and and fun for both participants and spectators. A variety of race formats keep things interesting as well, from short sprints to six day races. 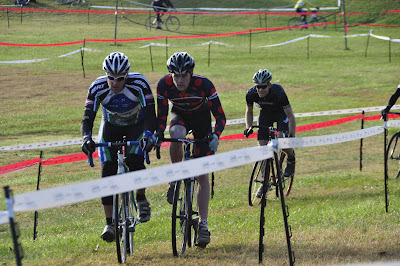 The majority of road, cyclocross and track racing in the United States is governed by the sanctioning body USA Cycling, with other similar organizations in other countries. USA Cycling handles the rulebook, race officials, rankings, licensing and other details. If you want to race road, 'cross or track in the United States it will benefit you to get a license from the USAC. For an extra fee many events allow one day license purchases, but registration for popular events often fills before race day. Additionally, you don't have sign up for many races in a season before you break even on the $60 annual license fee from USAC, and you won't be able to advance through race categories without a license. One important exception for race licensing is mountain biking. Professional mountain bike racing in the United States is governed by NORBA (National Off-Road Bicycle Association, a division of USAC) and requires a NORBA license. However, here in the Mid-Atlantic nearly all mountain bike races are unsanctioned grassroots events and you will have a difficult time finding NORBA events. Opinions may vary, but for mountain biking I prefer small, fun grassroots events and I don't miss the licensing requirements. The relationship between NORBA and mountain bike racing may vary by region as well. If you decide you want to get your feet wet and race, there are lots of places to find out about races, but I would start with bikereg.com. Bikereg is by far the easiest way to find and register for all types of cycling events. If you need further race recommendations you can ask your local bike shop, local teams and any friends that race. 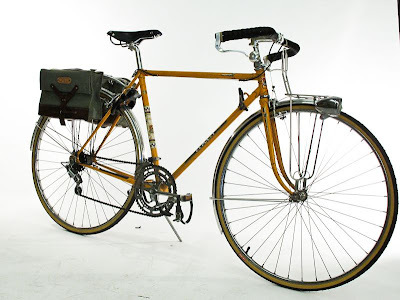 Velo Orange is not about racing so it may seem like an oxymoron for us to post about racing and why you should do it, but we don't think so. Racing certainly isn't for everyone, but it isn't mutually exclusive to the relaxed touring, rando and city riding we stand for. I'm thrilled to race one weekend and go bike camping the next. Two VO staff members race and it is simply another aspect of the sport of cycling that we love. If you love something then why not involve yourself in as many ways as possible, have some fun, and maybe meet some new friends? That is why we cycle: fun and friends. I've been pondering the Rando frame and its possible successor. Before I go on, let me say that we still have plenty of Rando frames available and plan to continue to offer them. They get great reviews and the folks who bought them seem to love them. Check out the nice article on the Chasing Mailboxes blog about Mark B's VO rando. 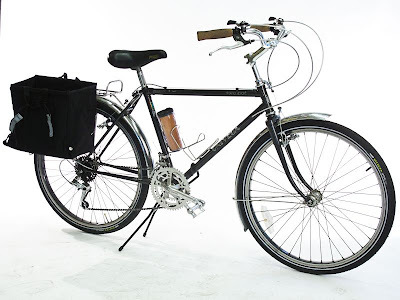 Nonetheless, after the new VO 650b Polyvalent (due in late summer) and the 700c Polyvalent tourer (due in early 2012) we'll need a new frame project to work on. It will be a low-trail design with geometry much like a Rando's. Ideal tire size would be 32mm, though 35mm would fit. It will have canti brakes since a pass hunter is meant to be ridden up and down mountains. Being TIG welded, it'll be a little lighter than the Rando. 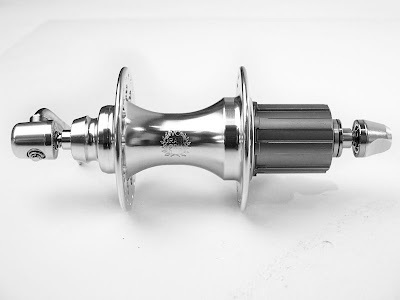 As much as I love lugs it's hard to get over the fact that they add $200-$400 to the price of a frame while offering only aesthetic benefits. We may use a lighter, and more expensive, tube set. This is a bit of a trade-off since thinner wall tubing is also easier to dent. We've even talked about using Reynolds 953. Still not sure if this is really worthwhile. 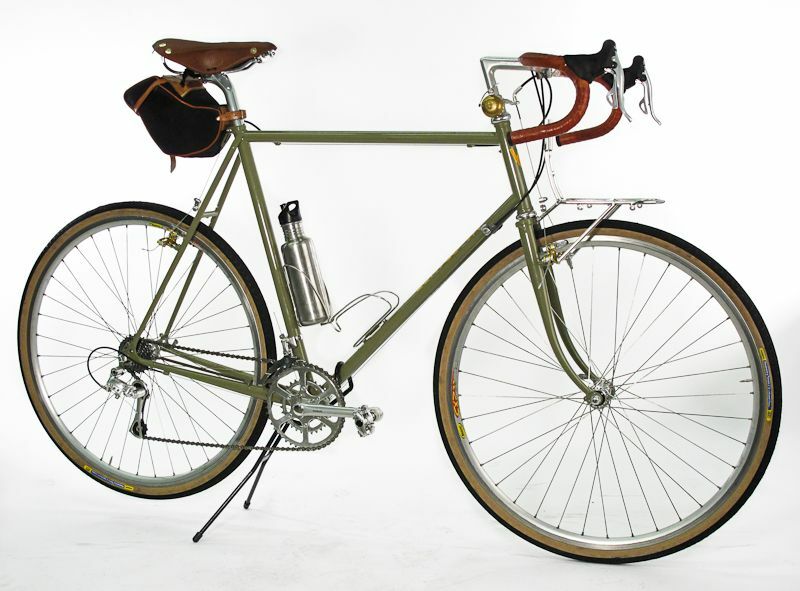 This lovely Lee Cooper Porteur by Alex Hatfield won the Best Utility Bike category at the Bespoke Bristol show. Note all the VO parts, racks, bar, chain case, fenders, etc. Alex says, "Without Velo Orange it would have been a very difficult project to complete". 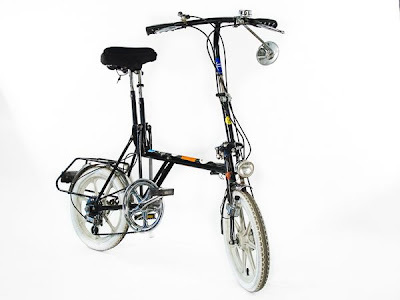 The frame is designed to carry serious loads and handle properly while doing so. 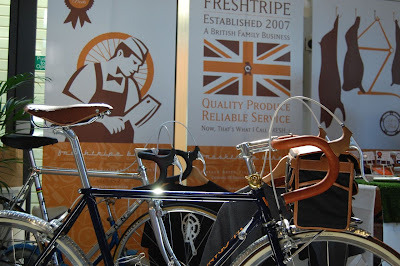 Jamie of Freshtripe (our UK distributor) sent along some photos and links from the Bespoked Bristol, The UK Handbuilt & Boutique Bicycle Show. It looked to be a great show with some amazing bikes. The show was a great success, I think everybody including the organisers were taken aback by the turnout - we were swamped all weekend with customers (new and old) who were pleased to be able to meet us and get their hands on the VO parts up close. The Rando build went down a storm and was great at illustrating the range of parts, a few people declared it their favourite bike of the show, quite a compliment given the competition! 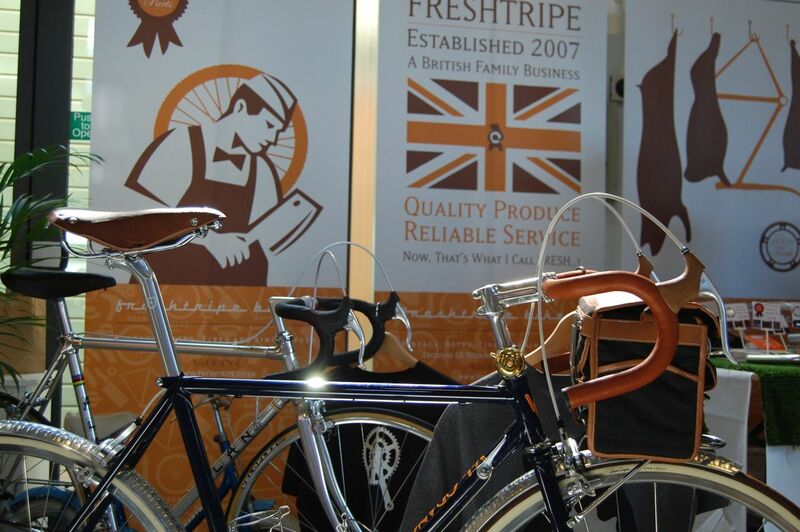 The stand was also a favourite as we'd gone for a traditional butchers theme (playing on the Freshtripe name) with the parts tagged and layed out on platters..
Also you'll be pleased to know that the Best Bicycle of Show by Donhou Bicycles (called Pimento Stuffed) featured VO items such as mudguards, seatpost etc and the Best Utility bike by Lee Cooper/Alex Hatfield Concepts (called Porteur) also featured some choice VO items such as the Porteur Rack, chainguard, muduards, bottle cages etc (as did his other creations) - both supplied by us. Paulus Quiros Desins wowed everybody as newcomers to the frame building fraternity with a stunning set of builds including a tandem, singlespeed and a polished Reynolds 853 road build which between them sported leather bar covers, bottle cages, mudguards, stems, seatposts, handlebars, GC Cantis etc also supplied by us - a situation which helped all involved to direct people to each others stands to see examples of the VO parts either available to buy or fitted to a bicycle.. If you're "across the pond" and need VO parts check out their site. They also distribute our part to other UK shops. 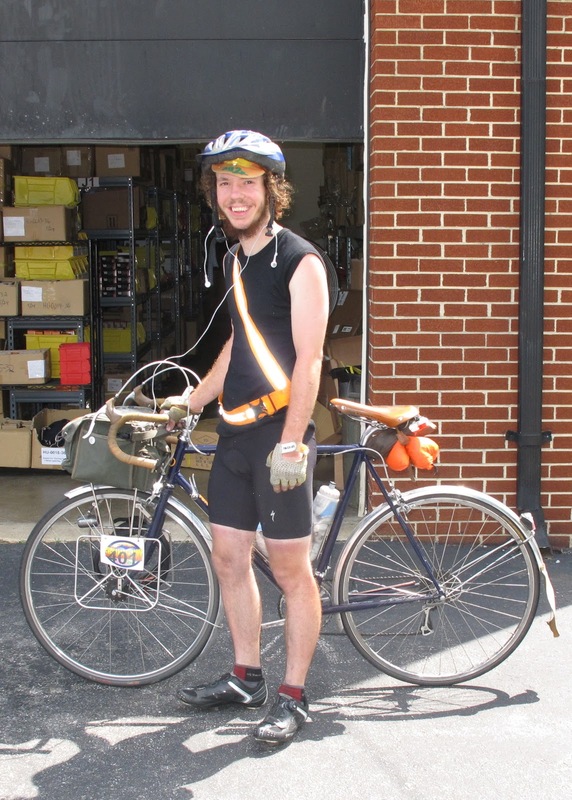 We want to congratulate Alec Burney who just completed the 1200 kilometer Shenandoah Brevet in a time of 84-hours and 50-minutes. 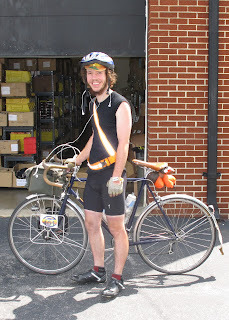 Not only did Alec complete the very mountainous ride and endure searing heat and torrential thunderstorms, but he rode the 60-miles to the start. Then he rode 60-miles back and, instead of going home, he came directly to the VO office to catch up on e-mails and answer tech questions! By the way, he rode his VO Rando with Grand Gru 50.4bcd cranks, dynamo, Ti Saddle, PBP rims, prototype rack, etc. 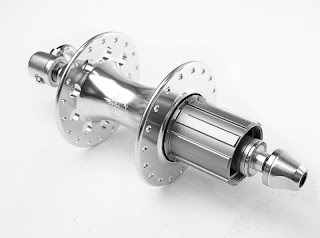 The first batch of production Grand Cru Touring Hubs just arrived. Even though we examined and tested six prototypes, I'm always nervous about new products until I see the ones that are production made. So it's really great to see that the quality and finish is every bit as nice as the hand-assembled prototypes. The Grand Cru Touring Hub is designed for long distance riding and heavy loads. 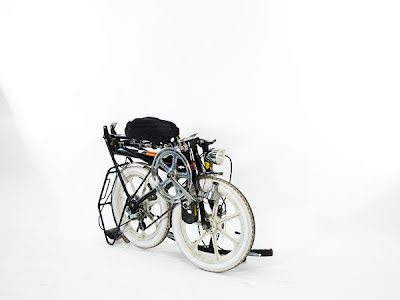 The sturdy hub shell is our own design. 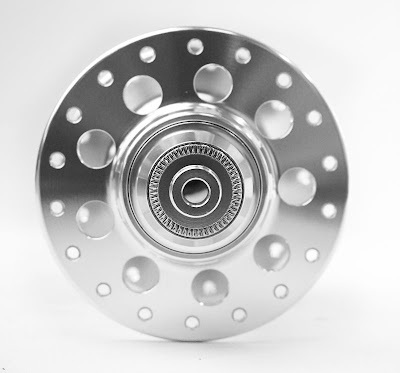 Being a large-flange hub there is room for four identical and rather large cartridge bearings. We use very high quality Japanese bearings. The bearings we chose are a common size and relatively easy to replace if they ever do wear out. The axle is hollow and oversized. 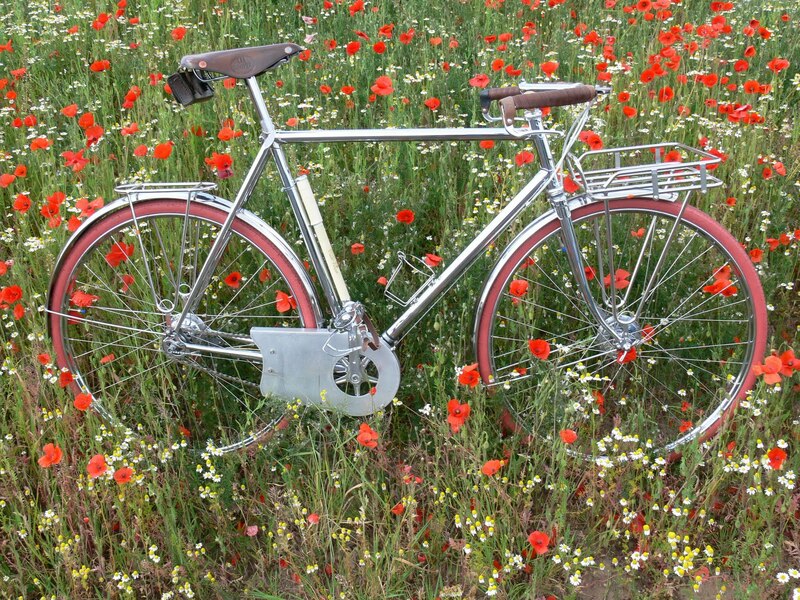 The free-hub body is steel for durability. There are three pawls with sturdy springs. 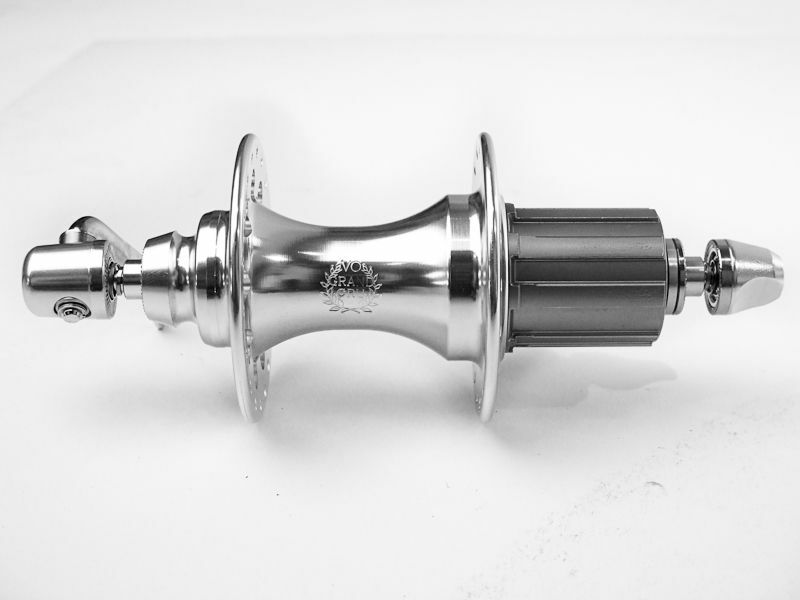 The touring hubs accept 8/9/10 speed Shimano-type cassettes. You can fit a 7 speed cassette by adding a 4.5mm spacer. The VO enclosed-cam quick release skewer is included. They are available in 130mm and 135mm spacing in 32h and 36h drilling. Matching front hubs are also available. The video we posted a few weeks ago showing how to disassemble the Grand Cru hub for field servicing without tools can be found here. They have been selling very well since we added them to the site late yesterday. I expect we'll run out before the second batch arrives later this summer. As soon as we have sufficient stock we'll have some built up with Raid rims and with Diagonale rims. The very first set of 36h is going on my bike. 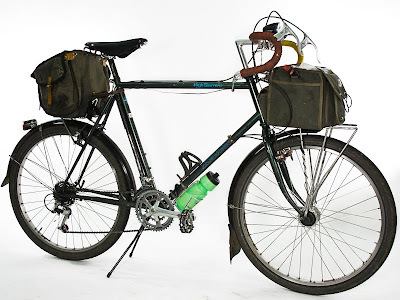 Nick's Schwinn High Sierra touring bike as ridden from Tacoma to Baja to Central Mexico to New Mexico and so on. Chris's VO Pass Hunter (prototype). 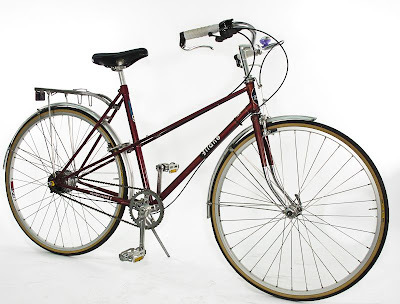 This will probably be production bike eventually. Annette's Gitane mixte city bike with 7-speed hub. Christopher's Di Blasi R6 folding bike, purchased and ridden when he was living in Amsterdam. What a busy week we're having, not much time to write blog posts. But I did want to mention a few items that just arrived. The 50.4bcd inner rings and 50.4bcd outer rings are here. We also have single speed rings. 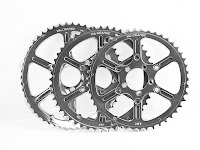 They are fully compatible with TA, Sugino, Nervar, Grand Cru, Stronglight, and most other 50.4bcd cranks and they work with 6-10 speed chains. 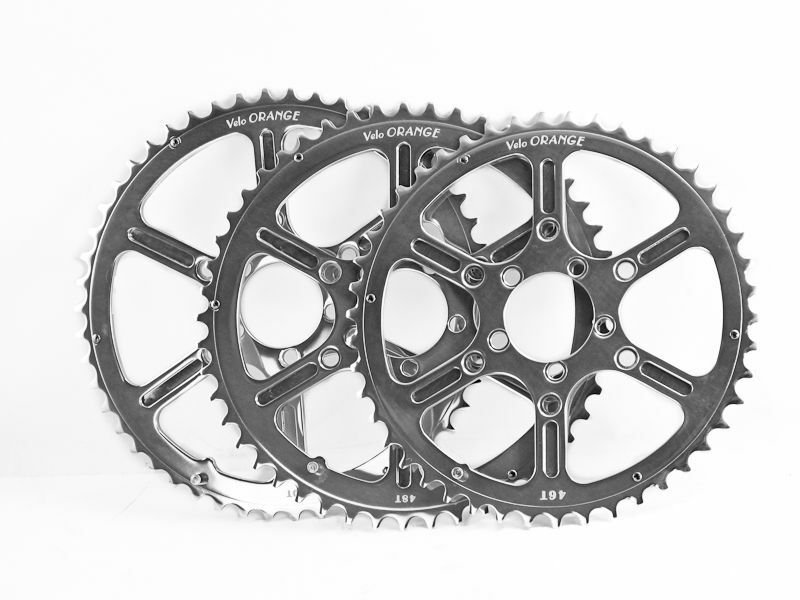 The VO compact double crank is back in stock. But a production problem has delayed the next shipment of 50.4bcd Grand Cru cranks by a couple of months. We have a few other small new bits: VO pedal replacement bearings, Grand Cru headset replacement bearings, and alloy crank dust caps. VO chain ring guards and fixing hardware will be on the site soon.